City of Sculpture’s favorite winter community event is back with Game Night! IceFest 2019- Game Night will take place on Friday, January 18 and Saturday, January 19 in downtown Hamilton, Ohio and is presented by Kettering Health Network. ⟿Donut Drop (Friday 5-7; Saturday 10-2) New this year! Visit Butler County, Ohio will be hosting Donut Drop play at ArtSpace on High Street where participants have a chance win an array of prizes on both Friday and Saturday. ⟿Showcase Carver Greg Butauski (Friday morning & afternoon) – Before IceFest officially begins at 5pm on Friday, the 2014 National Ice Carving Champion Greg Butauski will be carving a 12 block showcase piece in front of the Government Services Building that will remain on display throughout the event. Come to 345 High Street any time Friday morning or afternoon to see a nationally recognized ice carver at work! ⟿The Technicolor Ice Walk (Friday from sundown to 9pm) – Ice carvings along the Butler County Court House Lawn are lit up for the first night of IceFest for a unique night-time ice viewing experience! ⟿Fire & Ice (Friday at 7pm): Live large sculpture carving which will feature fire as a design element. This event will take place near the Butler County Courthouse lawn close to 2nd street. The sculpture will be lit on fire once it is completed between 8-9pm. 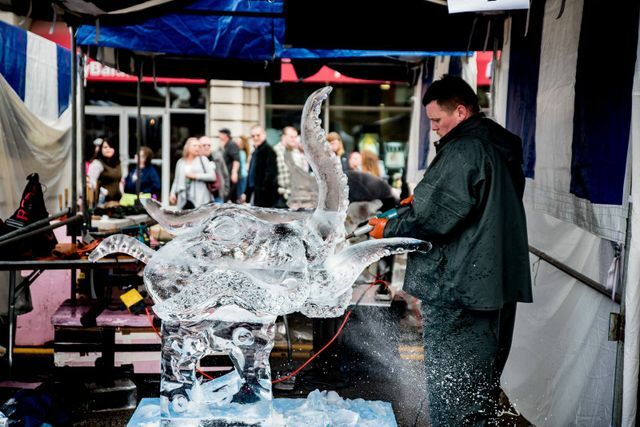 ⟿Competition Alley (Saturday from 10am – 2pm) Ten or more ice carvers from around the nation will be competing to create ice sculptures along 2nd Street. Attendees will have the opportunity to vote for their favorite sculpture, and the carver with the most votes will win the 2017 People’s Choice Award. ⟿Soap Carving Contest Awards (Saturday at 12pm) – Awards for the Soap Carving Competition will be presented at Courthouse Gazebo. ⟿Speed Carving (Saturday at 3pm) Carvers from Competition Alley will get 5 to 15 minutes to create an ice sculpture in front of an audience; some carvers will take audience suggestions, and others will encourage audience members to guess what is being carved while they are in the process of creating the piece. ⟿Explore & Make at Icefest – (Saturday 10 am – 2 pm) Visit Miami University Hamilton Downtown to learn about the reasons for the seasons with staff from the Cincinnati Museum Center. Explore seasonal camouflage using animal footprints, skulls, furs and more. If you can correctly identify the different animal visitors, you will win a wintry prize! The Lane Community Technology Center will also have maker stations set up with craft and technology activities for you to enjoy. ⟿Children’s area (Friday 4 pm – 9 pm & Saturday 10 am to 4 pm): The Children’s Area at Journal Square includes putt-putt, an ice throne for photo ops, tic tac toe & checkers on an ice board, and more! Soap Carving – The winners of the soap carving contest will be on display in the Greater Hamilton Visitor’s Bureau. ⟿Artfest – Get out of the cold by checking out Artfest, which will be held in the lobby of the Government Services Center while IceFest is ongoing. Amateur Photo Contest – A photo contest for amateur photographers attending IceFest. Sponsored Ice Sculptures – Ice sculptures sponsored by local businesses will be on display along High Street from MLK Blvd. to Front St.
⟿DORA on Ice – Liquor serving establishments will be featuring creative cocktails and ice cold drink specials for participants to enjoy while they explore the DORA. Don’t miss out on being part of this fun event and having your name in ice! You can order one or more ice bricks that will be constructed into a large wall of ice located in front of the new courthouse steps. Bricks can be inscribed in memory of or in honor of a loved one (spouse, child, grandchild, pet, etc.) or make a statement or quote across multiple bricks. A brick is 14” x 7” x 2” and allows for 2 lines, 9 characters each. Bricks are $30 each, two bricks for $55 or 3 bricks for $75. We hope you will support our effort by purchasing a brick or bricks. All funds raised support City of Sculpture’s projects throughout our community. Join the fun and see your name in ICE!